There is a dress being formed on a mannequin in the Dior ready-to-wear atelier. Its pale, pink, horizontal stripes are like the ghost of a sunset. It is also like the ghost of a garment from Raf Simons' first RTW collection for Christian Dior – Spring/Summer 2013 – that took place almost precisely three years ago. Far from being a literal, pale imitation, this dress is the refined version; its heavy duchesse satin shed, the striped satin finds form in the collection parkas instead; its geometry delicately engineered, particularly in the cut of its new ‘historical’ sleeves. This dress hovers between something of the past and something of the future, between underwear and outerwear, between sensuality and modesty, the dress of both a virgin and a whore. Raf Simons is looking at the dress. 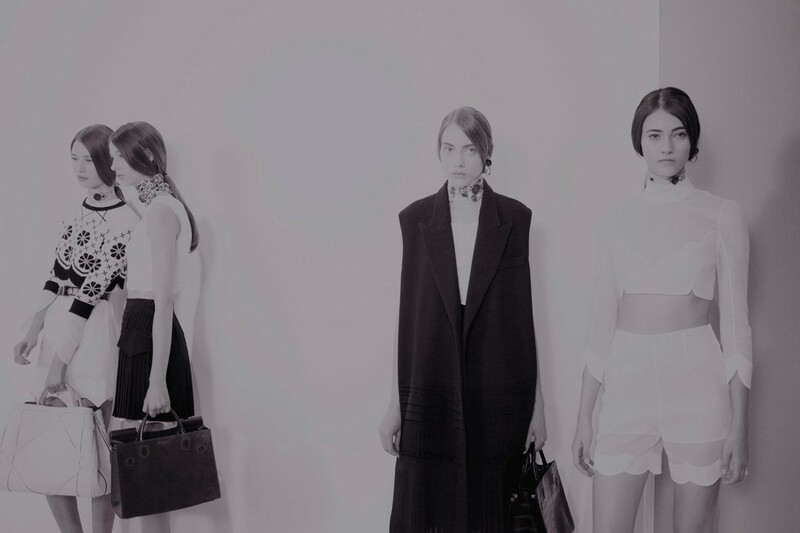 It is a few days before the ready-to-wear show is due to take place. “For me it feels very Agnes Martin,” says the designer. “Or maybe even Victorian Helmut!” he laughs. The two comparisons are very telling for Raf Simons; one of his favourite painters and his very favourite fashion designer have both been labelled ‘minimalists’ and each denied this description of their work, just as Raf Simons has himself. Instead there has always been something more sensual, human and dare it be said spiritual – certainly the case for Agnes Martin – in what each has wanted to achieve. Martin defined herself as an ‘abstract expressionist’ and maybe this is a better way to define the designer too. 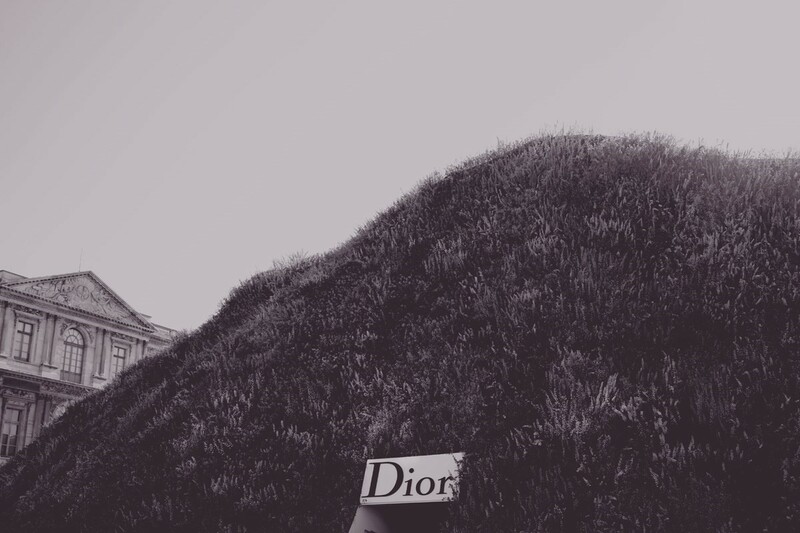 At the moment, the flower-covered mound can only be seen in computer-generated sketches and it has been met with some trepidation at Dior, but Simons is absolute in his faith in the setting and he is right. 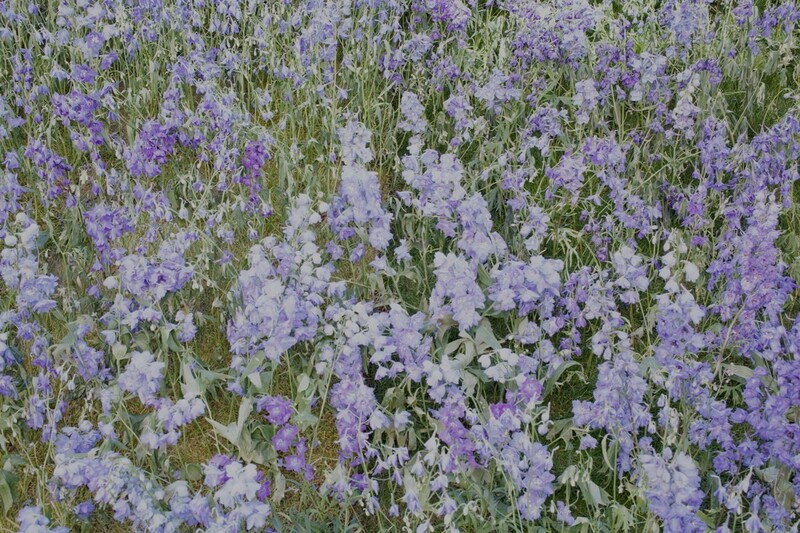 In the flesh – or the flower – the spilling, blue delphinium covered hill in the middle of one of Paris’ most historically resonant spaces – the Cour Carrée du Louvre – will be a sight to behold. A literal embodiment of soft futurism, the much meditated upon garden of Dior has grown wild over time and spilled out of its confines. “I was in the South of France a lot this year,” explains Simons. “I was inspired by the landscape of the South – I decided to look at something rougher and more natural than the garden.” In the next few days it will be the show producers, Bureau Bétak, who will be tasked with bringing this landscape to life in the Parisian courtyard. It will be worked on around the clock. Nevertheless, Michel Gaubert, Simons’ musical collaborator on the Dior shows, is put through his paces, finding techno and electronic alternates, all to be rejected on the morning of the show for the music Simons personally started with. Earlier in the process Simons had stated: “If we are going to use Elegia it has to be the full version and that’s about 17 minutes. The show can’t last longer than the song. Can we do that? I think it could be interesting to use one song…” And that is indeed what happened. The panpipes from Picnic at Hanging Rock greeted the guests as seating music for the show. A big clue as to what would take place. Dior is one of the quintessential Parisian houses, one of the true few remaining. Like the city itself, it has a layered history that is in evidence everywhere. What Raf Simons seems to have learned mainly from his time at the house and in the city, is the history of desire that infects the place. Christian Dior himself was obsessed with the period of the Belle Époque, bringing back the big skirts, nipped waists and extravagant elegance for his mid-century ‘flower women.’ But what Raf Simons does in the latest collection for Dior is strip the Belle Époque woman down to her underwear, at times leaving her choker intact, sometimes the date of Dior’s first collection dangling from it: ‘1947’. Yet this woman on offer has less to do with Mr Dior’s idealised version of the Belle Époque femmes and more to do with the period’s demi-monde filles, many of whom are on display in the Musee d’Orsay at the moment. Splendours & Miseries: Images of Prostitution in France 1850-1910, is an exhibition that particularly shows the influence of prostitution on the progress of modern art and in turn the progress of modern life. Charles Baudelaire once said "What is art? Prostitution." But he could have equally asked and answered "What is fashion? Prostitution" – principally when looking at the shows and collections this season in the city of Paris. Many seem permeated with the desire that seems to be so much part of the city and its history, and the Christian Dior collection is no different. It also points to its progress. In stripping the historied ‘femme fleur’ down to her literal, basic elements – her Belle Époque underwear and choker – in the world of Dior Simons has made a new, modern character for his collection and echoes the confrontation found in the figure of Edouard Manet’s ‘Olympia’, centrepiece of the Splendours & Miseries exhibition. Tired of the titillation of the ‘Venus’ figures submitted to the Salon, Manet rid his painting of the mythological window dressing and instead decided to evoke a contemporary prostitute at her workplace. With her cold, frank gaze the viewer is confronted with an essentially contemporary creature, free of the coquettish folderol of the Salon both in attitude and style. It is an attitude and style that fundamentally went on to shape modern art. In a similar sense, Simons has found the folderol of the femme fleur as something to be challenged. And it is perhaps in the Spring-Summer collection that her progress has become complete; she is no longer the grande dame attired for an eternal cocktail party and coquettishly playing games, instead she is more simply attired, contemporarily sensual and gazing frankly into the future.